Opinion: Can we rekindle civility? Rebecca Tollefson: It is this tradition of cooperation and collaboration that is driving a movement to revive civility across Ohio. When it comes to our politics, we shouldn’t expect to agree on every issue. But the Golden Rule of treating others as we would like to be treated is one that spans many faiths. We all need to focus on the principles of civility: listening respectfully, demonstrating empathy, and learning to disagree without being disagreeable. Fortunately, there are a number of good models of civility that are spreading across the state. In December, the Ohio Council of Churches worked with the National Institute for Civil Discourse (NICD) – started in 2011 after the Tucson shooting that injured Congresswoman Gabby Giffords – to promote a month of civility. We encouraged our 4,500 congregations and more than 2 million members to spend the month to use the holiday season to reflect on the need to heal our divisions, listen respectfully to people who have different views and support efforts to work together across ideological and political differences. We’re also working with congregations to set up civility conversations with a trained NICD facilitator who will lead groups in a free and respectful exchange of different ideas in a way that respects and affirms all persons while hearing their perspectives. NICD is leading conversations like these across Ohio – part of a statewide grassroots initiative in partnership with the Ohio League of Women Voters to build a civility movement. Ohio is one of four participating states as NICD works to reach 100,000 Americans over the next year. Our representatives in Washington are also heeding the call. Just last month, U.S. Rep. Steve Stivers, a Republican, and U.S. Rep. Joyce Beatty, a Democrat, announced the formation of the Congressional Civility and Respect Caucus, which requires that any member seeking to join have a partner from the other side of the aisle. It’s already up to 12 members who are pledging to act with civility and respect in their political discourse. These new developments build off of ongoing Ohio civility initiatives including the Ohio Civility Consortium at the University of Akron and Beyond Civility, which holds multiple civility events and workshops in the Cincinnati area. We have an advantage here in Ohio that there are already groups working toward the important goal of improving our politics and bringing us closer together. We owe it to ourselves, our friends, and our neighbors to breathe life into these events and organizations to help them grow strong. 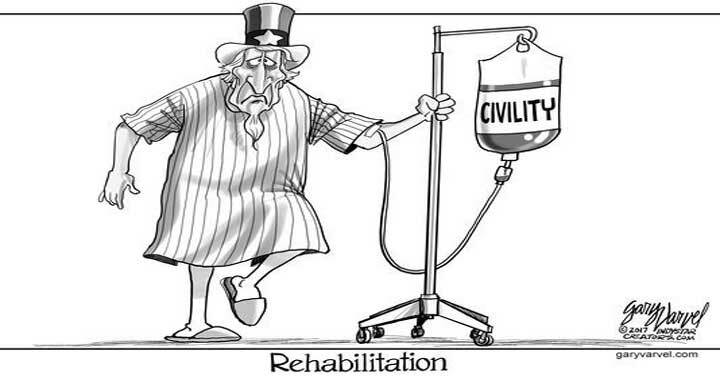 So I’d like to put the question to you: In 2018, what can you do to revive civility? It could be as simple as starting a conversation or showing respect to a friend who has different beliefs. It doesn’t take much effort, but it can go a long way.